A renowned music festival that celebrates the adventurous spirit and the open mind will be bringing its sixth edition to Shrewsbury in June. Emulsion takes place on Friday 15 and Saturday 16 June at The Gateway Education and Arts Centre. This follows last year’s festival at mac Birmingham, as well as three successful events in London, and one in collaboration with Cheltenham Music Festival. The headline musician for this edition is Steinway Artist Robert Mitchell, who will perform a rare solo piano set on the Friday evening. The Emulsion Sinfonietta will perform on the Saturday night, showcasing an existing repertoire and hopefully premiering two new commissions from Robert and pianist-composer Nikki Iles. To make these commissions happen organisers have launched a Kickstarter campaign to help assist with the preparation, rehearsal and performance of these new works, and closing Thursday 12 April. 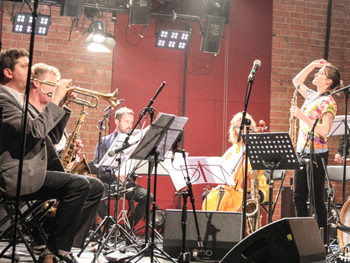 The brainchild of saxophonist, composer and Birmingham City University PhD student Trish Clowes, Emulsion VI will be hosted once again by BBC Radio 3 presenter Fiona Talkington. As a multi-genre event, Emulsion provides a platform for contemporary composition and improvisation, and fosters collaboration between like-minded musicians. Trish founded Emulsion in 2012 and, in 2016, Tom Harrison came on board as the festival’s Artistic Director. At the heart of its melting pot of musicians and ideas is the Emulsion Sinfonietta, a colourful line-up of trumpet, violin, clarinets, saxes, oboe, cor anglais, cello, bassoon, electric guitar, bass and drum kit. A happy by-product of several Emulsion festivals, the Sinfonietta has premiered 15 new works to date. Two of these works have gone on to win British Academy of Songwriters, Composers & Authors (BASCA) British Composer Awards in the Contemporary Jazz Category (Joe Cutler's ‘Karembeu’s Guide to the Complete Defensive Midfielder’ in 2016 and Cevanne Horrocks-Hopayian's ‘Muted Lines’ in 2017). As well as being recognised at the British Composer Awards herself – winning in the Contemporary Jazz Composition category in 2015 – and a former BBC Radio 3 New Generation Artist, Trish Clowes is one of 50 ‘STEAM Scholars’ at Birmingham City University. The research of the ‘STEAM Scholars’ is funded as part of the institution’s £3 million initiative to create new subject knowledge and to power cultural, societal and economic improvements locally, nationally and around the world. Her research looks at the politics of participation within and around the space of the Emulsion festival, exploring the relationships between performers and audience members through her compositions. “Emulsion VI is more of a residency, and it is also the first major case study for my PhD. I grew up in Shrewsbury and the venue – The Gateway Education and Arts Centre – is where I always perform with my band on tour, supported by the Gateway Arts Concerts series, run by Muriel Williamson. I’m conducting two workshops with audience members in the run up to the festival, as well as exploring performer-audience interaction during the festival itself. In addition to the main performances, Emulsion will explore other spaces in the venue, featuring ‘pop-up’ solo and duo performances from various Emulsion players, including violinist Mandhira de Saram (Ligeti Quartet) and oboist Melinda Maxwell (also a PhD candidate at Birmingham City University). Trish is part of the Jazz Studies research cluster at Birmingham City University, which is led by Professors Nicholas Gebhardt and Tony Whyton, and Dr Nicolas Pillai. 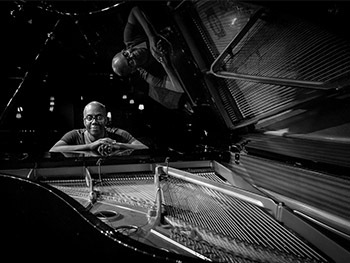 Although only five years old, the cluster boasts more than 40 members, including 10 jazz researchers from across Birmingham School of Media and Royal Birmingham Conservatoire, eight doctoral students and leaders of the regional jazz community, as well as additional academic partners at University of Warwick, University of Amsterdam (Netherlands) and University of Music and the Performing Arts Graz (Austria). Furthermore, the University’s new £57 million Royal Birmingham Conservatoire is home to Eastside Jazz Club, the first permanent jazz space in any UK conservatoire.